A series of sermons by Christopher Love. Everything I have ever read of Christopher Love is phenomenal. This book is no exception. It is a series of sermons on different topics ranging from “Christ’s prayer the Saint’s Support,” to “Directions Concerning Immoderate Joy for Worldly Comforts” to the series of sermons on “Wrath and Mercy.” In his sermons on “Wrath and Mercy” Love gives 4 sermons on this topic, each in his usual style of exposition, doctrine and application. They are hearty and full of life, and death for some. I was very moved by his sermon on “Directions Concerning the Nature of Sorrow.” Here he expounded 1 Cor. 7:30, “Brethren, the time is short; it remaineth therefore that they that weep, be as if they weep not.” He speaks to the heart about suffering and afflictions and the disposition of the Christian under these difficult trials. The sermons cover the following texts: John 17:15; 1 Thess. 5:21; 1 Cor. 7:30; Acts 16:30-31; Luke 11:28; and 4 sermons on 1 Thess. 5:9. 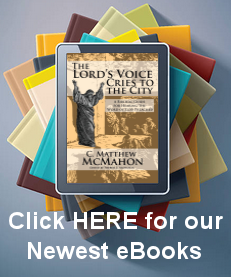 The volume is a spiritual garden of delights for anyone interested in knowing the Lord Jesus Christ in am ore intimate way.